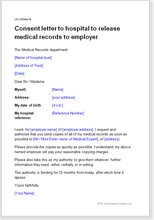 Set of letters from and to the employee, hospital and GP requesting various medicals information assists in formal organisation of an employee's permitted time-off or potential employment tribunal claims. Employee absence causes business setbacks and other repercussions. Keep yourself fully informed by obtaining medical information. Sensitivity and confidentiality is important in order to comply with employment legislation. These letters are designed to avoid the pitfalls of failing to use the right words to convince a doubting GP practice or medical records manager that you are entitled to the information you seek. Medical absence self certifications form. Any employer or manager with employees, including director's who needs to obtain medical information in the event of long term sickness or prior to recruitment.